This is not a Keeley original recipe, but I found it on Short Stop a few weeks ago and loved it so much I just had to share. I like hot chocolate. A lot. Before I got into coffee, hot chocolate was the only warm beverage I would consume. 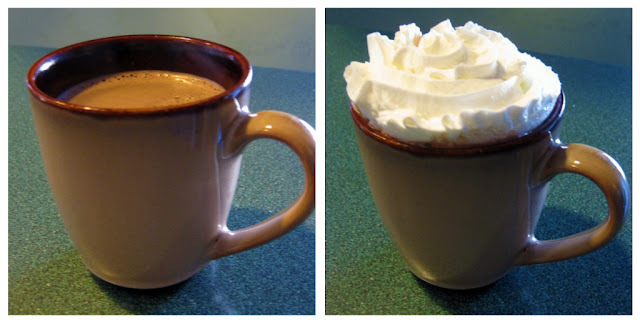 I used to think that the best hot chocolate was made from a premium mix from Williams-Sonoma. Now, that mix is good, but this homemade mix is cheaper and just as tasty (dare I say, better). The best part? If you don't drink it all, just pour it in a container, refrigerate it, and reheat it in a mug later and it tastes just as good... maybe even better. In a large pan on low heat, stir cocoa mix and water until melted. Add milk and beat with whisk until smooth. Heat on low until hot. Add vanilla. Serve. what a nice cocoa mix and I would love the mint chips for sure! doggybloggy, I actually used minature (mini) chocolate chips, but mint chips would be a really great idea. I'll have to try it! I need to make this for the kids. They always want hot chocolate and I don't like buying and making those packets of it. Ingrid, thanks for the blog love! It's always appreciated!